Barbara Gittings deserves a biographer, a feature film like Kinsey, and a national holiday. She was heroic at least since her freshman year at Northwestern (1949-50), when a Chicago psychiatrist proposed to "cure" her lesbianism and, rather than submit, or fall apart, Gittings devoted all her time to studying homosexuality in the medical and legal libraries. The dreadful descriptions ("deviate," "pervert"), the exclusively male focus, and the lack of any mention of love only spurred her on. Typical gusto: When she found the anonymously written book The Homosexual in America, she called the publisher to find out who the author was and arranged to meet him. Later, she met Phyllis Lyon and Del Martin, founders of the Daughters of Bilitis in California, and within two years she had begun a New York chapter despite living in Philadelphia. She edited the group's magazine, The Ladder, and became friends with Frank Kameny in Washington. Together they organized the phenomenal picketing of the White House in October 1965 and at Independence Hall, where Gittings carried a sign reading Homosexuals Demand Their Civil RIghts. She and Kameny were instrumental in convincing the APA to de-list homosexuality as a mental disorder in 1973. 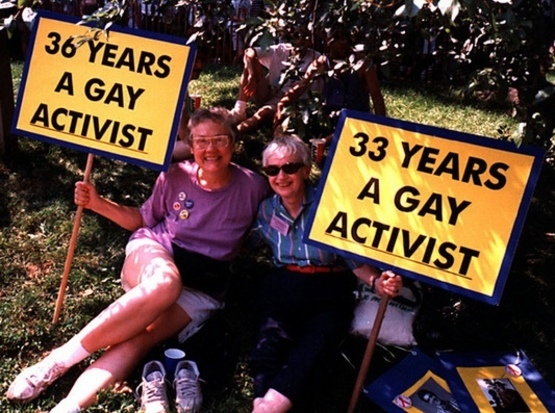 With her life partner, Kay Lahusen, whom she met at a Daughters of Bilitis picnic in 1961, she never stopped working for gay equality. Several awards are named in her honor, including one from GLAAD. There should be more.